A wall hung basin frame is designed for wall mounted basin installations where the supporting wall isn't strong enough alone to safely and securely hold the weight of your bathroom sink. It's built into the wall, usually stud-walls or partitions, and there is a variety to choose from. Some of our wall hung basin frames can hold around 150kg making them perfect for making the basins safe for a wide variety of applications. Whether securing a wall mounted basin to a stud-wall, partition wall or even part-height walls you can do this in both domestic and commercial settings. At Victorian Plumbing, we pride ourselves on stocking top brands and manufacturers. 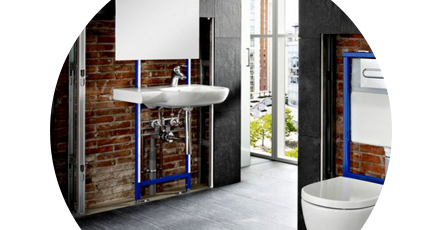 Each wall hung basin frame is made to the highest standards and you'll find brands such as Geberit and GROHE who are highly-trusted names for wall mounted fixing frames.